Cholesterol and blood glucose screening for your employees is the first step to improving your workplace wellbeing. Taking just 5 minutes, the results could have a major impact on an individual’s life. Our Lifestyle Coach will administer individual cholesterol and blood glucose screening in a friendly and professional manner. Our Lifestyle Coach can perform up to 80 tests a day! This is a simple non-fasting procedure with immediate results; guidance is given with signposting to correct referral pathways. Outcome: Early awareness, improvement and maintenance for a healthy heart and body. Reduce levels of employee sickness and absenteeism. Blood Glucose: The amount of sugar that is present in the blood. High levels of sugar could be an indicator of diabetes. Wellbeing People will help you to organise your health screening day for your workplace or organisation from start to finish. Promotional literature, eInvites, and posters will encourage and engage employees and individuals to book an appointment to be screened. 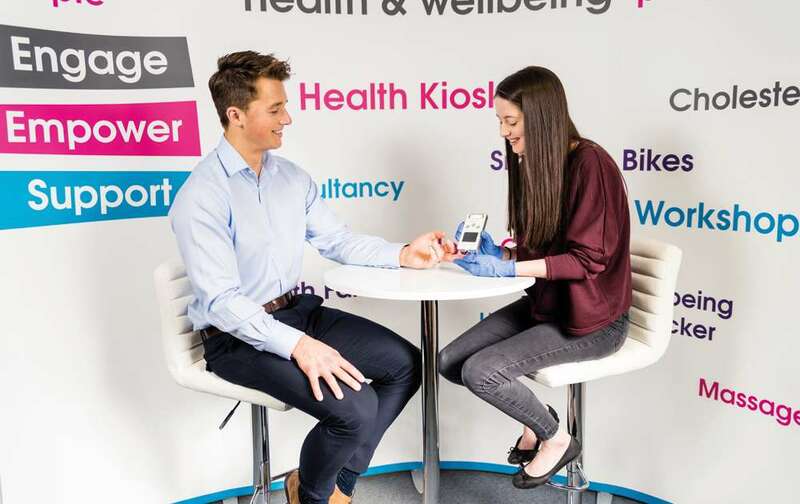 The onsite cholesterol and blood glucose screening takes just five minutes and is delivered by one of our trained Lifestyle Coaches. Individuals are provided with a results sheet which is discussed and simple guidance is given. 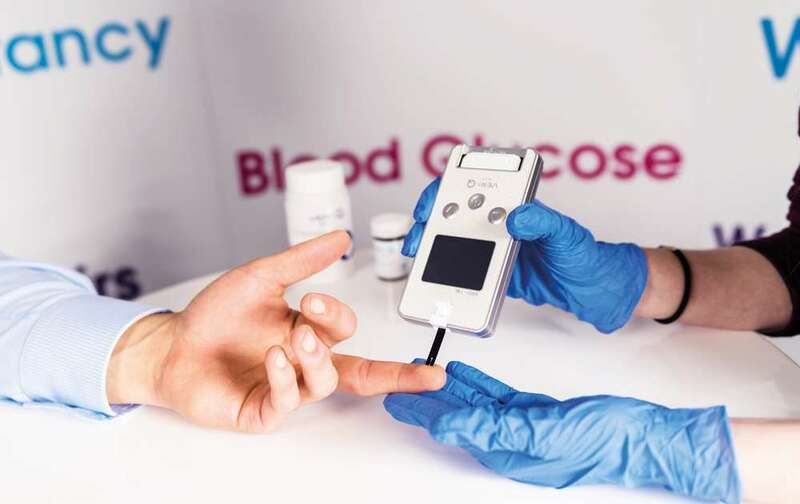 The cholesterol and blood glucose screening is carried out by trained lifestyle coaches from our wellbeing team. Cholesterol and blood glucose may seem inconsequential or only important if an individual shows symptoms, however the reality is that a large amount of people are unaware they have a problem that could be serious. If left untreated, cholesterol and glucose problems can lead to sudden and long term illnesses such as a stroke or Type 2 diabetes. This one simple test could help to prevent such illnesses and staying productive. There is no need for your employees to fast before the screening, though the accuracy may be affected if the individual has eaten within 30 minutes of the test. Non-fasting tests make the screening effective for assessing whether there is a need for your employee to visit their GP for further tests. The results are instantaneous and a results sheet is provided to each employee explaining the tests carried out and what readings are considered a concern. After the event we can provide an anonymous management report showing the aggregated test results. We work with you on the creative brief for the promotion of your event/programme and provide you with a booking system to organise your cholesterol and blood glucose screening day, making it as easy as possible for your employees to benefit from the service. Our Lifestyle Coaches are always flexible to your needs. Health Screening Day you can combine the cholesterol and blood glucose testing with our onsite Lung Age and Smokerlyzer® screening which take just five minutes also. Our team will carry out the test and provide the results to each individual with a results sheet and we will discuss the results and provide simple guidance. 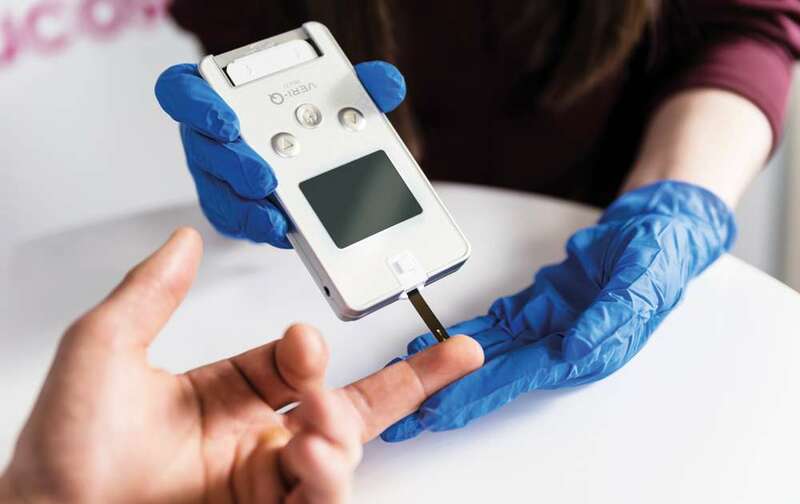 Cholesterol, blood glucose and lung health screening combined will increase the test time to ten minutes per person, allowing us to test approximately 40 people per day. Our Lifestyle Coaches are on hand to signpost the individual towards the correct referral pathway if they have concerns. We work closely with organisations to ensure the journey from initial engagement to final outcome, maximises the potential to improve the health and wellbeing of the individual, by identifying the need and marrying it up to an appropriate intervention, whilst supporting the individual through to a positive measurable outcome. A suitable room that is not too busy, a meeting or training room is ideal, with a small table and two chairs. It is best to avoid noisy and crowded areas as employees may have concerns that they wish to discuss with our Lifestyle Coach in private. Being aware of Cholesterol and Blood Glucose levels can be one of the first steps to improving and maintaining a healthy heart and body. Having workplace health screening helps to identify risks to employee’s health and improve their wellbeing. It also shows employees that they are cared about by the organisation they work for and demonstrates dedication to keeping their workforce healthy and happy. Just thought I would drop you a line to say that the Wellness guy who came yesterday was fantastic! Really lovely guy and the tests were great with over 30 people being tested for their cholesterol etc. I was just wondering if we could book him again. I wanted to organise a wellness event for professionals and friends and family on the 25th January and thought this would be great offering?